Comp Cams Bronze Distributor Gears are one of the first requirements when installing a steel roller cam. A stock cast iron distributor gear is not compatible with a steel camshaft gear. COMP Cams gears are machined from AMPCO-45 extruded aluminum bronze with 5% Nickel added. These gears feature a high-strength tooth design that resists wear even when used with high pressure oil pumps. 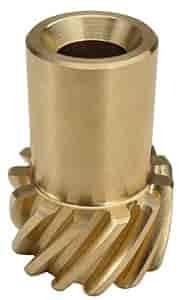 412 - Comp Cams Bronze Distributor Gears is rated 5.0 out of 5 by 1. Rated 5 out of 5 by chole from bronze gear tried this gear with roller cam with melonized gear, looks to be wearing great. fit good with no issues!